Just look at that sparkle! The bride and groom put so much time and energy into each choosing a wedding ring that would be perfect for their spouse-to-be. These silver bands will stay on their ring fingers for the rest of their lives, so it’s a good thing that these ones are beautiful! 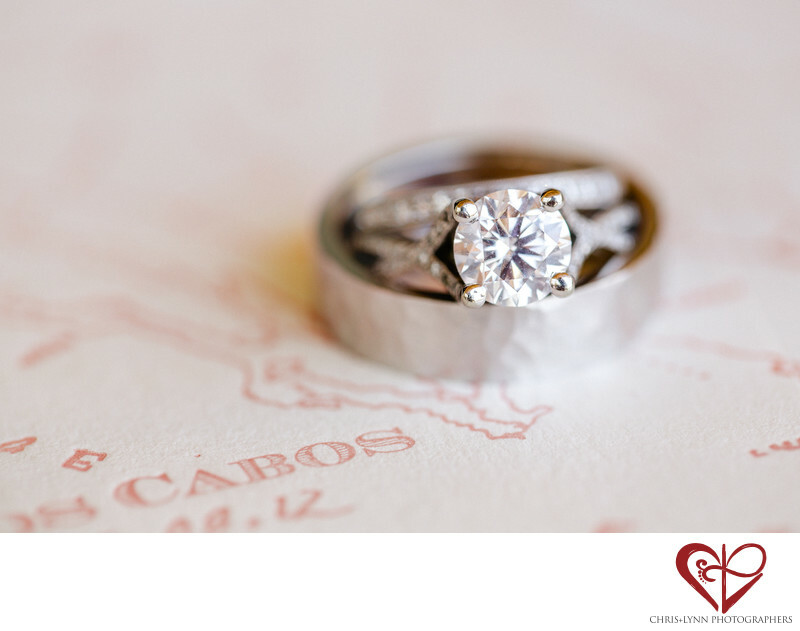 In this photo, we captured the sparkling rings atop the custom wedding invitation. When looking closely at the bride’s ring, the intricate details of the main gem stand out. They say a diamond is a girl’s best friend, and looking at this ring, it’s hard to deny! Both rings were custom made by Geengee. The wedding rings have a huge symbolic importance, but they also offer a physical declaration of love. On the inside, the bride’s ring reads “Amour de vie” along with the date that the lovebirds got engaged! So romantic. 1/200; f/4.0; ISO 400; 100.0 mm.